This webpage summarizes some of the scientific studies that document risks, detriments and tradeoffs associated with MMR and measles vaccines. Measles can be spread from fully vaccinated people to other fully vaccinated people. Measles vaccine failures cause outbreaks of the disease. Emergency room visits are significantly more common in children who were recently vaccinated against MMR. Children who contract measles are significantly less likely to develop allergies than children who are vaccinated against measles. Children with a history of measles are significantly less likely to develop allergies than children without a history of measles. Children who never received an MMR vaccine were protected against allergies. The MMR vaccine significantly increases the risk of seizures. Febrile seizures are serious adverse events that occur at significantly elevated levels after MMR vaccination. Vaccination with MMRV (measles-mumps-rubella-varicella) significantly increases the risk of being hospitalized for febrile convulsions. MMR significantly increases the risk of thrombocytopenia (ITP), a serious internal bleeding disorder. Thrombocytopenia, a serious autoimmune bleeding disorder, is 5 times more likely to occur after MMR vaccination. Measles and mumps infections in childhood protect against deadly heart attacks and strokes during adulthood. Vitamin A supplementation is highly protective against complications and death from measles. Many European doctors think that measles is a harmless disease and do not recommend mandatory MMR vaccines. Severe Afflictions affecting nearly every body system -- blood, lymphatic, digestive, cardiovascular, immune, nervous, respiratory, and sensory -- have been linked to the MMR vaccine. Source: Multiple studies; The vaccine manufacturer; Physician's Desk Reference (PDR). 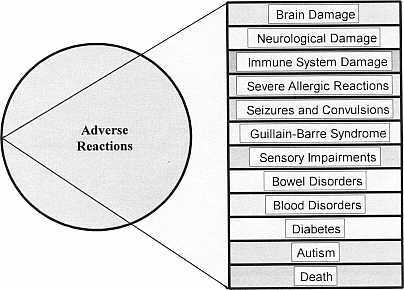 This diagram is elaborated upon in the chapter on MMR in the book, Vaccine Safety Manual. Witsenburg, B.C. "Measles mortality and therapy," pp. 26-27. From an abstract of a 1967-1968 measles epidemic study conducted in Ghana. Ahmady, A.S., et al. "The adverse effects of antipyretics in measles." Indian Pediatrics 1981 January: 49-52. Kazarian, E.L., et al. "Optic neuritis complicating measles, mumps, and rubella vaccination." American Journal of Ophthalmology 1978; 86: 544-47. Marshall, G.S., et al. "Diffuse retinopathy following measles, mumps, and rubella vaccination." Pediatrics 1985; 76: 989-991. Brodsky, L., et al. "Sensorineural hearing loss following live measles virus vaccination." International Journal of Pediatric Otorhinolaryngology 1985; 10: 159-63. Nabe-Nielsen, J., et al. "Unilateral deafness as a complication of the mumps, measles, and rubella vaccination." British Medical Journal 1988; 297: 489. Hulbert, T.V., et al. "Bilateral hearing loss after measles and rubella vaccination in an adult." New England Journal of Medicine 1991; 325: 134. Stewart, B.J.A., et al. "Reports of sensorineural deafness after measles, mumps, and rubella immunisation." Archives of Diseases of Childhood 1993; 69: 153-54. FDA. "FDA workshop to review warnings, use instructions, and precautionary information [on vaccines]." (Rockland, Maryland: FDA, September 18, 1992): 27. Faich, G.A., et al. "Measles outbreak in Rhode Island." Public Health Report 1981 May-June; 96(3): 264-266. CDC. MMWR (February 1, 1985). CDC. MMWR (June 6, 1987). Gustafson, T. "Measles outbreak in a fully immunized secondary school population." New England Journal of Medicine 1987; 316:771-74. Markowitz, L.E., et al. "Patterns of transmission in measles outbreaks in the United States, 1985-1986." New England Journal of Medicine 1989; 320:75-81. Robertson, S.E., et al. "A million dollar measles outbreak: epidemiology, risk factors, and a selective revaccination strategy." Public Health Reports (January-February 1992), p. 24. Edmonson, M.B., et al. "Mild measles and secondary vaccine failure during a sustained outbreak in a highly vaccinated population." Journal of the American Medical Association 1990; 263:2467-71. Minnesota Department of Health. "Measles summary, 1987." CDC. "Measles." MMWR 1989; 38:329-330. CDC. "Measles -- Quebec." MMWR 1989; 38:329-30. CDC. "Measles -- United States, 1990." MMWR 1991; 40(2):369. CDC. "U.S. Childhood Immunization Update: Measles." (March 1997). CDC. "Measles -- United States, 1999." MMWR 2000; 49(25): 557-560. Sabin, A.B., et al. "Successful immunization of children with and without maternal antibody by aerosolized measles vaccine. I. Different results with undiluted human diploid cell and chick embryo fibroblast vaccines." JAMA 1983; 249:2651-62. Sabin, A.B., et al. "Successful immunization of children with and without maternal antibody by aerosolized measles vaccine. II. Vaccine comparisons and evidence for multiple antibody response." JAMA 1984; 251:2363-71. Whittle, H.C., et al. "Immunisation of 4-6 month old Gambian infants with Edmonston-Zagreb measles vaccine." Lancet 1984; ii:834-37. Whittle, H., et al. "Trial of high-dose Edmonston-Zagreb measles vaccine in The Gambia: antibody response and side-effects." Lancet 1988; ii:811-814. Aaby, P., et al. "Trial of high-dose Edmonston-Zagreb measles vaccine in Guinea-Bissau: protective efficacy." Lancet 1988; i:809-811. Garenne, M., et al. "Child mortality after high-titre measles vaccines: prospective study in Senegal." Lancet 1991; 338:903-907. Whittle, H.C. "Effect of dose and strain of vaccine on success of measles vaccination of infants aged 4-5 months." Lancet 1988; i:963-66. Khanum, S., et al. "Comparison of Edmonston-Zagreb and Schwartz strains of measles vaccine given by aerosol or subcutaneous injection." Lancet 1987; i:150-53. Tidjani, O., et al. "Serological effects of Edmonston-Zagreb, Schwartz, and AIK-C measles vaccine strains given at ages 4-5 or 8-10 months." Lancet 1989; ii:1357-60. Markowitz, L.E., et al. "Immunization of six-month-old infants with different doses of Edmonston-Zagreb and Schwartz measles vaccines." New England Journal of Medicine 1990; 332:580-87. Awadu, K.O. Outrage! How Babies Were Used as Guinea Pigs in an L.A. County Vaccine Experiment. (Long Beach, CA: Conscious Rastra Press, 1996).